This page explains how integration with Trac is possible in Testcollab. While defining the global settings provide the URL, along with Username and Password used to access your Trac instance..
You also have an option of allowing the reported issue to be resolved automatically when the related test case passes by checking "Resolve reported issues when a failed test case is marked as passed". When you check this you will be prompted to provide the status code that Trac uses for resolved issues, you need to enter the same for "Status code for resolved". project - You have to specify your project name here. issue type - Here you can specify that the issue type you are reporting is a defect, enhancement or anything else. You have to write name of type in your value field of Test Collab, for example, for defects write defects in value. priority - You can define the priority of the issue here. You have to write name of priority in your value field of Test Collab, for example, if you want tickets to have priority set as minor then write minor in value field. milestone - Here you can specify the milestone for all defects created from Test Collab. You have to write name of milestone in your value field of Test Collab. component - Fill the Component name to which all defects created from Test Collab should be assigned. You have to write name of component in your value field of Test Collab. version - Fill the version name to which all the defects of the particular project belongs. For example - 1.0, 1.2 etc. reporter - Here you can specify the username of the user who is reporting issues from Test Collab. This field is an optional field, if you will leave this field empty all issues will be set as reported by Project Leader. 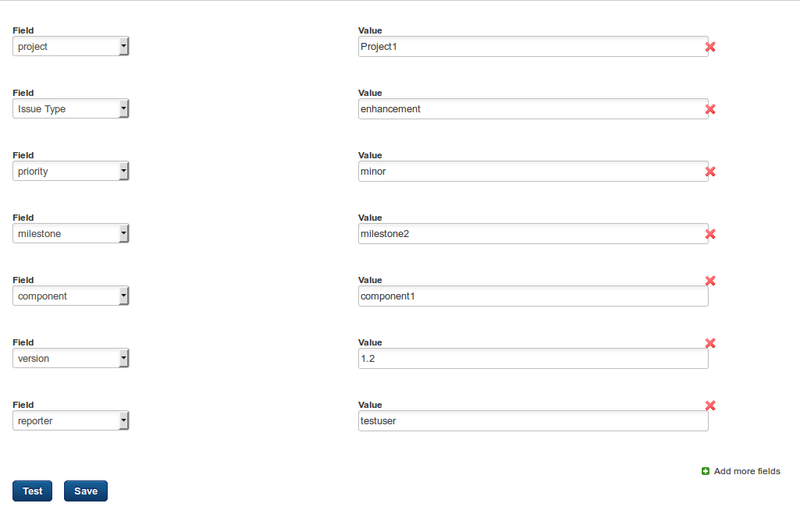 A completed project specific issue manager setting form for Trac would look like this.